Orthodontic treatment is the process of correcting your teeth alignment. Having well aligned teeth improves not only your appearance but can also significantly improve oral health and function. Orthodontic treatment can be safely and predictably undertaken at any stage of life—it is not just for children and teenagers. Fixed braces are the most common method of orthodontic treatment for younger patients, while clear orthodontic aligners – InvisalignTM are very popular amongst adults. In young children, removable appliances (also known as ‘myobrace’) can sometimes be used to improve the arrangement of teeth, by harnessing and gently guiding the growth of the young jaw bones. The use of these appliances in some cases may reduce the length of treatment with fixed braces or eliminate the need for braces later in a child’s life. 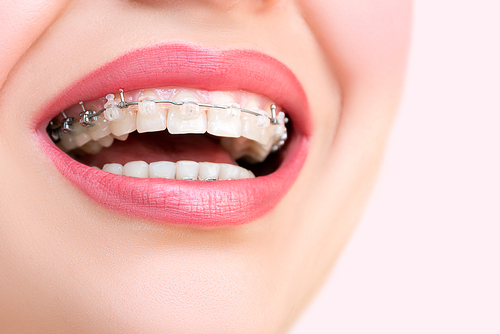 Most people wear braces for between one and two years. After your braces are removed, you may need to have a permanent retainer cemented onto the inner side of your teeth and issued with a removable retainer to wear during the night, to make sure your teeth do not move back into their original position. Orthodontic treatment may be necessary for several reasons. You may have difficulty chewing, a cross bite (where your upper front teeth rest behind or inside your lower front teeth), a deep bite (your upper front teeth completely cover your lower front teeth), an open bite (your front teeth do not touch when biting together), or simply have crowded, overlapping, or spaced out teeth. Your upper and lower teeth may not line up or look like they are on an angle. Your dentist will complete a full dental examination, including x-rays, photos, and impressions of your teeth. Assessment and planning the best treatment option may take several appointments. If your teeth are not suitable for treatment by a general dentist who specialises in orthodontics, your dentist will refer you to a specialist orthodontist for more complex treatment. At Toothkind, we need to understand your end goals and why you wish to correct the alignment of your teeth. This way we will have a better idea of what type of treatment would suit you better. Once you have raised concerns with your dentist about the alignment of your teeth, they will then discuss the benefits of Invisalign® you. A set of aligners will be sent to your dentist, who will then make sure it fits you and is comfortable. Each set is made of a clear and sturdy medical plastic, and should be worn night and day for two weeks each. You take out your aligner during meals, to drink, and to brush your teeth. The entire Invisalign® treatment can take between 6 and 18 months, depending on the severity of your problem. The benefits of clear orthodontic aligners are numerous. The aligners are comfortable, not causing irritations that can occur with braces. They do not prevent you from eating certain foods, and as they are clear and thin, it is unlikely anyone will even notice you wearing them. Invisalign® treatment will leave you with a straighter smile, without anyone noticing it happening! Not all our Dentists offer this procedure but our lovely receptionists can inform you further. To make an orthodontic appointment with Toothkind, get in touch today.